« Are you Hard Working?? 1) One entry per user, per blog. Don’t use multiple blogs as separate entries. 2) Caption may contain humor or may not. In the end best will be chosen. 6) At least ten entries are required to decide winner. Is This What Is Meant By Having A Ball?! can i in.. great idea … cheerss and keep the spirit to blog ..
It’s really awesome….. Nice one dude… From where you are getting these stuffs? I can’t think of anything witty for a caption … too early in the morning and the coffee hasn’t worked its charm … but the photo gave me a warm smile! The more you read blogs and surf the better you get the stuff. you can always add later. Still 2 days left. So far just 2 entries. 8 still needed. true sportsman spirit ,started practicing for 2012 olympics from today . A new brazilliant captain, huh? Hi. My Name is Ronalfant, and I’m…. …Wow! you guessed it right, I’m the striker! What are you looking at? 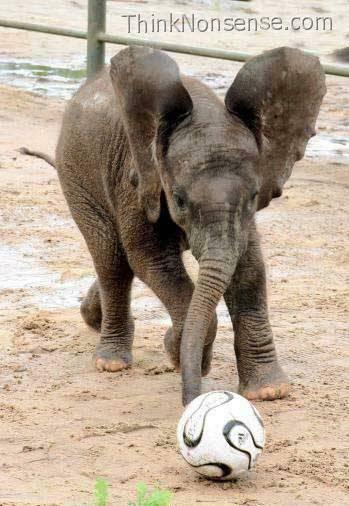 Can you play soccer like me…with your nose? Wow! Congratulations to the winner. The caption is beautiful. I love it too!